Heavy rains are infamous for causing roof damage. The last week alone, it rained 5 days out of 7 in the week (as of this writing July 27th, 2018), causing severe thunderstorm warnings, flash flood warnings and more. Today, Friday the 27th, the National Weather Service issued a severe thunderstorm warning at 1:29 PM for the areas surrounding Albany and Clifton Park, citing 30 mph winds, golf ball sized hail and wind gusts of up to 60 mph. So what do frequent storms mean for your roof and how do they cause damage? When hail reaches golf ball like sizes and pummels to the earth, the force is enough to actually cause a series of tiny dents or indentations both on the top of the roof itself and in the metal flashing. But it doesn’t take golf ball sized hail to cause damage: even hail stones the size of a marble can cause immediate damage. Different types of materials absorb the damage from hail in different ways, so if you’re inspecting your roof, look for dings or puncture holes in the shingles, on your gutters or any metal based materials. For any vinyl or wood type material (like vinyl siding or wood shakes) look for outright cracks. Small black dents or punctures (caused by the asphalt getting displaced, exposing the raw color). Textures that look like bruising on an apple. Splitting wood, often in a burnt orangish or brown color. Shingle split with no deterioration on the sides of the shingle. Marks, dents and other similar signs of impact. However, hail damage isn’t always immediately obvious just by looking at the roof itself and seeing physical signs of damage on the outside. Because of the force of impact and the consistent dropping of hail on its surface, damage can often occur underneath the surface of shingles. This is damaging to the protective underlayments that keep water out of your home. If the air smells moldy, or if you physically see mold, that’s a sure sign of a roof leak. Strong winds can just flat out blow a shingle off your house if they’re powerful enough. Plus if you don’t spot the missing shingles right away, what happens is that the next time there’s a storm blowing by, new rainfall damages your roof’s underlayment (protective covering from water) because it is exposed without protection from shingles. Then water seeps and gets underneath other shingles, spreading the damage out and transforming the job from a patching roof repair job into a problem requiring a more complete roof replacement. Whenever water gets in and damages the underlying area of your roof, it damages your interior insulation, the roof decking (which is almost always plywood) and the drywall. 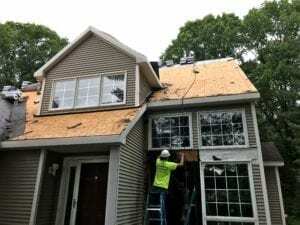 What that means for you is that instead of just having to repair your roof, you’re also looking at fixing interior insulation, drywall and even your siding. Where as hail causes puncture or impact damage and high winds can potentially blow a shingle off (called blow-off), heavy, consistent rains cause damage in a different way: through erosion. If you want to see the full power of erosion, just google the Grand Canyon and you will see how water created the world’s biggest ditch over time. Asphalt shingles aren’t immune to erosion and heavy rains wash away the granular surface on the shingles over time. Water can then seep into sealing strips that are missing or damaged flashing. When the granular surface (the grainy, almost sand-paper-like feeling on the top of a shingle) is worn away, it stops the granules from serving the purposes of protecting the roof from UV rays (which wear the roof out faster), diminishes their beauty (making it look old and worn out, meaning your property value goes down) and the roof becomes less fire resistant. Worse, when water is able to get underneath the shingles, during winter water will freeze, form up into ice and cause the shingles to bulge out – causing 3-4x the damage. One of the more obvious direct signs of damage to the roof is when a tree or tree limb just straight up falls on your home. The obvious tell of damage is a big ole’ hole, but the main concern here is that if the tree falls during a storm, and causes the damage while the rains are occurring, then water is going to flow through protective covering and into your home resulting in the damage spreading uncontrollably. This can happen even if there isn’t an obvious hole caused by the tree or tree limb. The very first thing you should do is inspect your roof and the interior of your house yourself. Even if you do not immediately see leaking water in your home (leaks usually aren’t as obvious as an immediate dripping onto your head). To reiterate from above, on the interior you want to look for signs of moisture or residual moisture damage. Other common signs are interior warping of plywood or drywall. The first interior place you should always check is the attic, because water will leak through there first. To inspect your roof yourself, the easiest method is to grab a ladder that’s tall enough to reach and climb up on top of it and inspect it visually. Alternatively if you have easy window access, you can opt for climbing out of a window. However, we have to stress that you need to take proper precautions and safety measures, especially if you have a steeper roof and not a walker roof (one that you can walk on easily without a harness). If you are uncomfortable with heights, go grab a pair of binoculars and walk far enough away from your home that you can clearly see your roof, and inspect that way. If you happen to be an early-adopter and own a drone, that’s a fantastic way to inspect it as well! 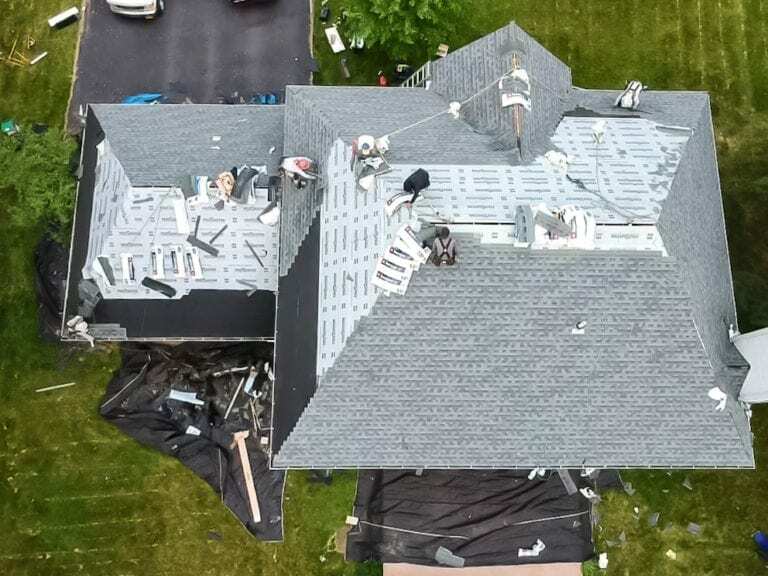 Infact, many of our roof inspections start with using a drone to spot hard-to-see trouble areas before going up directly. Using a pair of binoculars or a drone is, for obvious reasons, a lot safer, as it does not require you to physically go up on top of the house. What can I do to prevent damage to my roof before a storm? Unfortunately, there isn’t much that you can do to prevent damages ahead of a storm. However, a buffer between your home and the storm, for instance if you have tall strong trees, the foliage can actually help to mitigate damage from hail or heavy rains by absorbing most of the impact. But in that case, there’s always the risk of the tree itself falling and causing damage. Plus it’s not like you can exactly have mature, well grown in and strong trees installed on your property. Those take decades to grow. But if you are looking to buy a new home it might be something to keep an eye out for reasons other than trees look pretty. Most of the best protection you can have comes way before the storm ever occurs: investing in a top rated roofing contractor who is certified by manufacturers (such as GAF, Owens Corning, Certainteed or IKO) and one that has an excellent track record of construction that meets exacting warranty specifications is perhaps the best thing you can do. Hiring cheap or skimping out on materials is often what leads to roofs going bad prematurely, and requiring you to pay more for costly repairs and replacements. One area you may want to double check when you’re getting estimates is the material brands of your roofing system. Most manufacturer warranties are voided out if the company installs another manufacturers parts along with the roof. So for example if you had GAF asphalt shingles with IKO synthetic underlayment, you would not qualify for a GAF warranty (or an IKO one). However, one area where a contractor might make their bid more competitive is by doing exactly that – mixing and matching materials (which voids the warranty instantly). Remember each manufacturers materials are designed to be used together as a complete system and they won’t guarantee it if it’s not installed to their exact specification. The other thing to do is to make sure you have a good homeowners insurance policy – most of them will cover damage that is caused specifically from storms as “acts of God.” Which takes the burden of repair and replacement costs off you. If this is your situation, make sure to have a professional come out and do an inspection. You can book a roof inspection from us to do a 200 point check. After a roof leak happens, what can I do to prevent further damage or temporarily stop the leak? Measure the distance of where the leak is from gable (wall that connects to roof) to the ridge (where two sections of roof join). After storm is over, go on top of your house wearing rubber soled shoes (sneakers are preferred, boots will damage shingles). Measure to the same distance point of where the leak is using your measurement from inside. 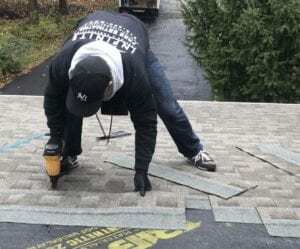 At the outside source of the leak, temporarily reinforce the patch job by applying roofing tar to the underside of the outside asphalt shingles. The first thing you want to do is go into the attic and clear insulation off of the wet drywall on the ceiling. Any standing water you see you’re going to want to sponge off and remove. Then place a piece of plywood across the joists (the beams of wood). On top of the plywood, place a bucket to catch any dripping water. This prevents water damage from seeping out across other areas. **DO NOT PLACE BUCKETS DIRECTLY ON DRYWALL*** Placing a bucket directly on drywall can cause a catastrophic collapse of the drywall when the bucket becomes heavy and filled with water. After you have done the basic damage control and contained the water that’s already there, you’re going to want to follow the leak back to the spot where it’s coming through the roof. Be advised: this could be far away from where you see the dripping part of the leak. Water will follow the path of least resistance and that means where you see dripping water is simply the point where it’s easier for the water to fall downwards, rather than following a trail from somewhere else. Normally you can follow the path along a rafter, but sometimes the water is actually going underneath the plywood roof decking. Once you’ve identified the source area of the leak, make a temporary patch using roofing tar and either a spare shingle or a piece of plywood. Trowel (a fancy way of saying apply) roofing tar onto the underside of the decking using a putty knife. Place a shingle or piece of plywood onto the tar and trowel more tar around the edges of the patch job. After you’ve made the temporary patch, measure the distance of the leak from the gable (the wall that leads up to your roof, usually triangular) and from the ridge (where two sections of roof meet, basically the peak of the house) while you’re in the attic using a tape measure. Please make sure you wait until the rain stops before you try going on top of your house. When the rain does stop, wear rubber soled shoes (never leather or boots), go up on the roof and measure the same dimensions on the exterior as you did on the interior. Look at where the source of the leak is on the outside while you’re there and reinforce the underside of the shingles with more roofing tar (this is waterproof and durable and is a common use for fixing leaks). Again, please don’t attempt to access your roof without taking the proper safety precautions. No need to add a hospital visit to repair bill. Should I cover my roof after the emergency leak repair or if I can’t do repairs myself? Yes, it is generally a good idea to cover it if you performed emergency repairs yourself or you couldn’t access your attic to do the repair patch and have no way of knowing where the source of the leak is. Get a plastic cover (usually a 4 foot roll of 6-mil polyethylene plastic, available at most local hardware stores). You’re going to want to unroll the plastic, but not unfold it. Measure just enough to cover a full section of your roof from the eave (the part that runs into the walls of your home) to the ridge. Add an additional four feet to your measurement and cut it from the roll using a utility knife. Unfold the plastic just one fold and make an 8 foot wide strip. Roll one end of the plastic around an 8 foot two-by-four and staple the plastic to the wood. Cut another 8 foot two-by-four and nail it to the first, with the plastic sandwiched between two pieces of wood. Climb on top of your home and place the wood right alongside the eaves, then stretch the plastic over the ridge covering the location of the leak. Staple the opposite end to yet another two-by-four and nail a fourth two-by-four to that one. Allow that pair of two-by-fours to hang down on the opposite side of the ridge. When should I call a roofing contractor to make the repair? Generally, if you want to save the longevity of your roof, you’re going to want to have any significant roof damage repaired as fast as possible. The above emergency fixes just help to prevent further damage from happening. Additionally, there’s a good risk of injuring yourself if you try to repair all the damage yourself, so it’s definitely recommended to have a professional do it for you. When is damage large enough that I have to replace the roof and not just repair it? If you are seeing black mold, can smell or see rotting wood or have significant holes, it really just needs to be replaced (you can do partial replacements on sections of your home). Age of the roof matters of course, and if you’re buying a new home make sure you double check how long ago it was replaced. Generally we recommend having an inspector come out to specifically check the roof for any patch jobs, inspect the overall quality of it and whether significant repairs and replacement need to be done. Especially if you’re buying the home, having the inspection means that if a replacement needs to be done you can often qualify for a low-interest home improvement loan with New York State, called a “rehab” loan, which is designed to offset the cost of replacement and refurbishments on major projects when buying a home. Does Insurance Cover Roof Replacements Resulting From Storm Damage? Generally most homeowners insurance policies cover roof replacement costs following major storms or other “acts of God” events like fires. You’ll have to check with your insurance provider to see how much they’ll cover and what their exact steps are and you’ll want to call them as soon as you can. 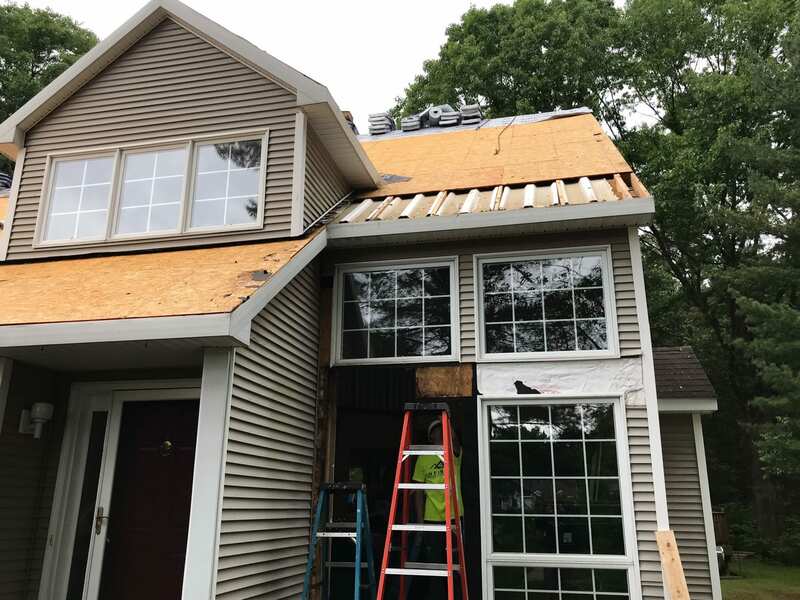 This is one of those things that makes you thankful for homeowners insurance, because otherwise the untimely event of having your roof damaged are usually not planned for and there isn’t savings available, making it a difficult purchase decision. Another method is taking on a home loan, if for whatever reason insurance does not cover your roof or you are uninsured. While not as ideal as insurance coverage, it is a way to get the emergency work done without major savings around to put in. Roof replacements can cost anywhere from $5,000-$7,000 all the way up to $10,000+ depending on the size of roof, materials and extent of damage. We do have roof financing available which you can look at on our home page, however make sure you get an estimate BEFORE seeking any kind of financing.